Shares of a Chinese juice company exploded Tuesday after investors got wind of the company’s pivot to fintech. It’s a growing trend among companies to announce a new focus on cryptocurrencies or blockchain and watch the stock rise in kind. 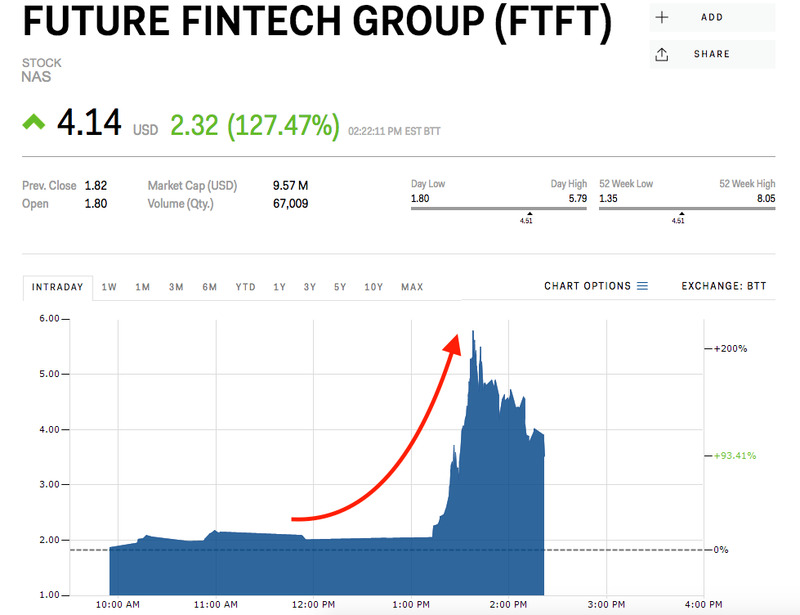 Shares of China’s Future Fintech Group, an unprofitable firm formerly known as SkyPeople Fruit Juice, exploded as high as 221% Tuesday after the company announced it would pivot to financial technology, eventually settling up roughly 127%. The pivot happened on May 26, 2017, according to public filings, but investors appear to have taken little notice before today. The stock steadily declined in price through the summer before Tuesday’s extreme rise. Future Fintech Group previously received a written warning from Nasdaq on December 1 for failing to maintain a market value above $US5 million and risked being delisted if it did not pass the threshold by May 2018, according to public filings. Today’s jump brings the firm’s market cap to roughly $US9.57 million. FTFT is the most recent example in a long-running list of companies that have exploded in value after pivoting to cryptocurrencies or announcing a pivot to blockchain technology.